As part of the ongoing Press Gang Week, today's featured historian is Niklas Frykman. Dr. Frykman received his PhD at the University of Pittsburgh in 2010, where is currently an Assisant Professor in the Department of History. He specializes in mutiny in European navies in the long eighteenth century, and his work is published in Mutiny and Maritime Radicalism in the age of Revolution: A Global Survey, Mercantilism Reimagined: Political Economy in Early Modern Britain and its Empire, and in the Journal of Social History. I showed Dr. Frykman seven primary source images depicting press gangs at work, and asked him to choose the one that best captured the nature of press gangs in the eighteenth century. I don’t think any of the images really captures impressment very well, and really they say much more about the various prejudices that English society had about sailors in particular, and the working class more broadly, than about coercive recruitment. I also find it really remarkable that you’ve only been able to find seven prints! That in itself is extremely telling, it seems to me. However, I do think overall that Collet and Barlow do a better job than the others. First, they do not portray those pressed as respectable artisans and middling types set upon by the violent sailors of the press gang, as is the case in some of the other ones. 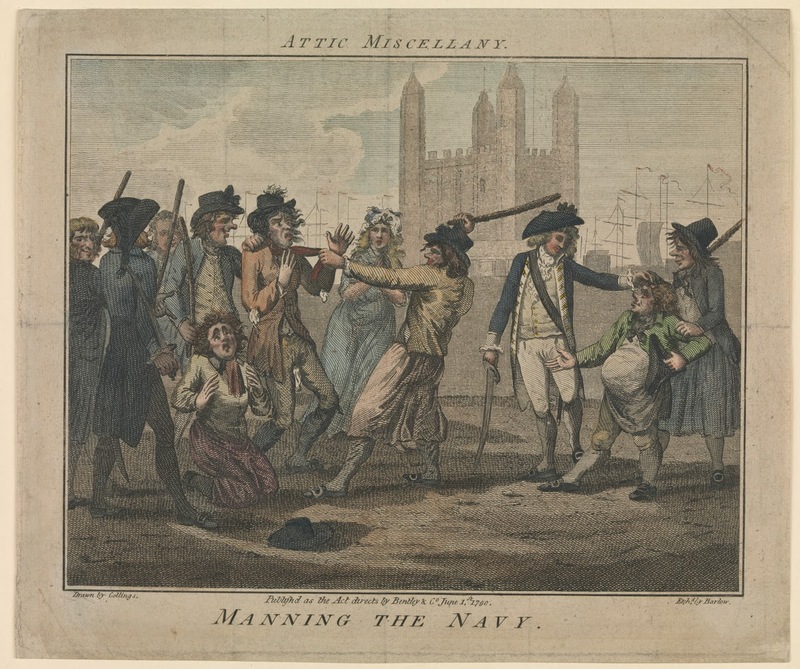 For one thing, it is clear that the primary purpose of impressment was not just to hoover up manpower, but specifically to funnel skilled manpower (that is, experienced sailors, not tailors!) into the navy. But I also dislike the politics of this implied contrast between the landed respectable working class and the disreputable, violent, uncouth and unprincipled maritime working class, whose denunciation is achieved by portraying them as the perpetrators of the very violence they in fact were victimize by. What makes that contrast worse is that in some of the prints there are no officers or other higher ranking representatives of the impressment hierarchy present, thus making the sailors of the press gang sole agents, and turning the whole thing into an example of intra-class rather than the inter-class violence it really was. 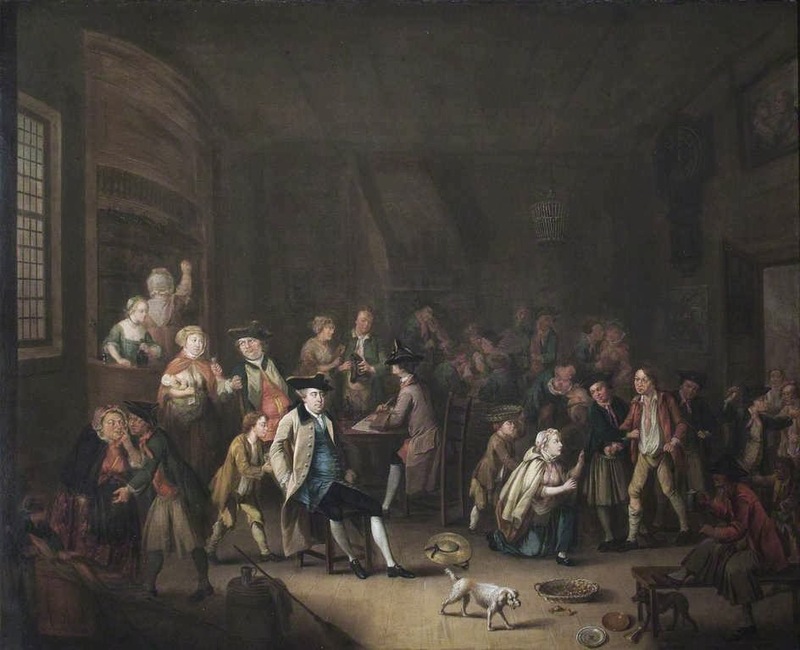 More positively, what I appreciate about Collet is the way the image shows the humdrum, almost banal nature by which impressment often tore families apart (and took men to their deaths). But the violence upon which that banality arose is at best hinted at. In Barlow, in contrast, it is central, though its sting is removed by the cartoonish, literally de-humanizing nature of the image. 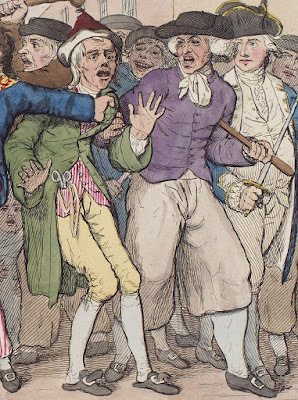 So, all in all, none do a great job, but each captures elements of the truth (like the importance of women in fighting the press gangs in Rowlandson or Gilray, or the political implications in the images from the Lewis Walpole Library) and Collet and Barlow in a way accumulate most truthful elements, while avoiding some prominent prejudices. 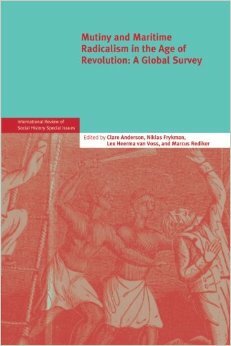 Pick up a copy of Mutiny and Maritime Radicalism in the Age of Revolution: A Global Survey, co-edited by Dr. Niklas Frykman to learn about other forms of violent resistance in the maritime world of the eighteenth and nineteenth centuries.